Brushing teeth is an essential everyday activity that protects teeth from rotting, building plaque, and losing their aesthetic appeal over time. Even though standard manual brushes work well, individuals who want to experience faster and better teeth cleaning results should consider purchasing and using a quality electric sonic toothbrush for the following reasons: even though slightly expensive, for instance, these toothbrushes have premium electrical systems that clean teeth thoroughly without irritation. They also remove plaque and tar efficiently, eliminate the need for hectic manual brushing, and are manufactured using durable high-performance materials that serve users well for long without compromising comfort and or safety in any way. For the best experience, however, purchase one of the 10 models listed herein. They are durable, very easy to use, and thus, recommended for daily usage. 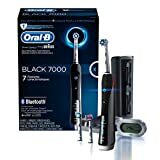 Top on our list, Oral-B BLACK 7000 SmartSeries is a powerful and rechargeable electric toothbrush for adults with a Bluetooth enabled system that streams brushing data directly to smartphones and other Bluetooth-enabled smart devices. It is durable, has a light, portable, and easy to use design, and has round cross action brushes that remove, plaque, stains, and food residues better than most comparable models. You also get a powerful and rechargeable battery pack, six pre-set modes of cleaning (tongue cleaner, sensitive, whitening, daily clean, deep clean, and gum care), and a professionals-inspired design with durable and BPA-free components. 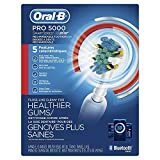 This SmartSeries of the popular Oral-B Pro 500 line of electric toothbrushes is a powerful Bluetooth-enabled model that draws power from a rechargeable battery pack. It is durable, connects and transmits real-time data to smartphones, and has an advanced CrossAction round brush head with angled brushes that clean fast and efficiently without irritating users. You also get a pulsating, rotating, and oscillating sonic technology for removing up to 100% more plaque than manual brushes, and a dentist-approved BPA-free design that comes optimized for healthier cleaning. Do you have a child with issues using traditional manual brushes? 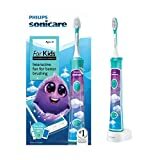 If you have a few dollars saved on a new brush and want a kid-friendly electrical brush that can eliminate the hassle of manual brushing, Philips Sonicare HX6321/02 is a valuable accessory to consider. It is light, durable, and has a non-irritant design that gets kids excited about brushing in the morning and at night. The patented sonic system on offer is 75% more effective than manual brushes. Its ability to generate up to 500 strokes per minute is impressive, while its BPA-free construction and ability to penetrate and clean hard to reach areas without irritating the mouth makes it an ideal everyday accessory. You also get a rechargeable battery pack, an interactive application that educates children, and eight fun and interchangeable brush stickers. 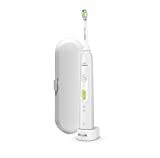 Essence of the renowned Philips Sonicare line of electric toothbrushes is a durable white-themed sonic electric toothbrush that removes up to two times more plaque and stain than most manual toothbrushes in the market. The standard e-Series brush head that is comes with is soft and durable. The dynamic fluid action it generates cleans the gum line and between teeth well, while the two-minute time and the 30-second alert features in offer guarantee a safe and healthier brushing experience. Philips Sonicare Essence draws power from a rechargeable two-week capacity battery pack, has a reminder for faded brushes, and soft well-contoured brushes. Ranking tenth on our list of the 10 best sonic toothbrushes in the market, Philips Sonicare HealthyWhite plus is a novel toothbrush with a high-performance motor-driven sonic technology that generates up to 31,000 brush strokes per minute. This cleans teeth fast and thoroughly. It also generates a smooth sonic action that cleans along the gum line and hard to reach areas such as between teeth to remove up to 100% more stains and up to seven time more plaques for teeth than most traditional manual toothbrushes. This is impressive, especially to avid smokers and individuals who have a hard time using the irritant manual brushes in the market. All parts are sturdy and made of BPA and phthalate-free materials. You also get three intelligent settings and a light and portable design. Best-known for the quality and dependable product in its arsenal, Philips is a novel brand that ranks among the best of all time. If you are shopping for a new electric toothbrush and want a durable model that reflects its value, Sonicare 2 Series is a well-designed model that offers superior plaque control (up to six times better than most traditional brushes) without damaging teeth or irritating users. It has a stylish coral theme, has a patented sonic technology that generates up to 31,000 strokes per minutes, and has an ergonomic and comfortable head with a dynamic fluid action that clean along the gum line and between teeth well. It also has an integrated Smartimer that encourages the recommended two-minute cleaning time and a snap-on removable brush head that is relatively easy to replace when damaged or worn. Other notable features are its powerful battery pack with a two-color indicator, its compact and space-saving design, and safe BPA and phthalate-free construction. Featuring an ultra-high-powered sonic cleaning technology that generates up to 36,000 strokes per minute, Wellness HP-STX is a premium household accessory that offers notable results. It has a high performance dock charger, 10 professional grade brush heads, and a light and portable design that is perfect for use indoors and outdoors. All parts are durable and BPA-free. 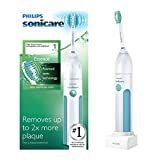 Its unique ability to remove more plaque and stains over 100% better than manual toothbrushes are innovative, while the three cleaning modes on offer (massage, soft/gentle, and power/clean) guarantee a thorough and comfortable cleaning experience with no or minimal irritation. You also get a timer alert feature that shuts it off automatically after two minutes and alerts users to move to other areas after 30 seconds of brushing, easy to remove and color-coded brush heads that allows family members to share a single main unit, and a durable enclosed storage that accommodates up to four brush heads. Chosen by clinicians worldwide among the best electric toothbrushes of 2015, Brio SmartClean is a professional-grade sonic toothbrush with a rechargeable, durable, and safe battery that lasts for six weeks per charge. If bathroom space is a concern, you no longer have to contend with the bulk and noisy electric toothbrushes that people have relied on for years. By choosing this model, you get a compact and light accessory perfect for everyday usage. The ergonomic brush head on offer is comfortable and qualifies for a subscription replacement service. 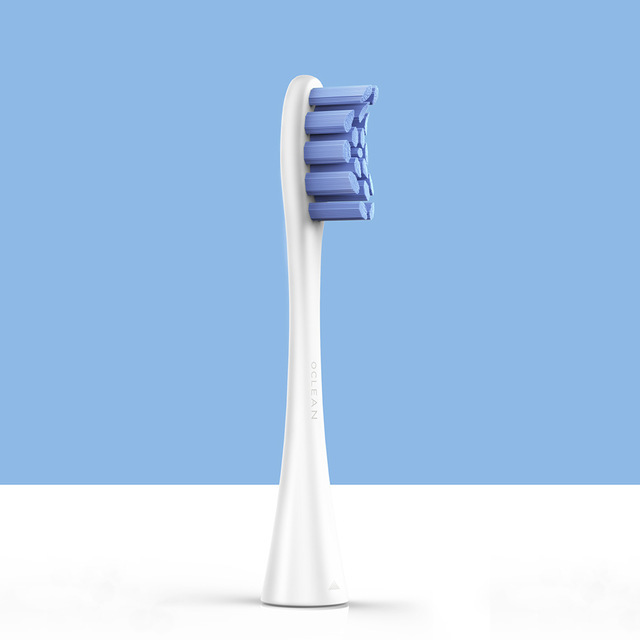 Its patented sonic technology generates up to 31,000 brush oscillations per minute, while the three brush modes on offer (including a two-minute timer and zone reminders) guarantee a clean and comfortable brushing experience, whether you have a sensitive mouth or otherwise. You also get BPA-free components and a two-year limited warranty. Designed for use for by both kids and adults, Sunsmiler is a portable electronic sonic toothbrush with a slim yet durable design that fits comfortably in the mouth. It is affordable, features the renowned sonic cleaning technology for better mouth-care, and has a portable and functional design that vibrates at 23,000 oscillations per minute. 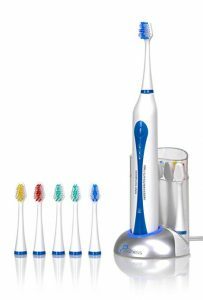 Its electric motor system works quietly, while the professional-grade cleaning head that it comes with is perfect for removing stains and plaque, polishing teeth, and massaging gums and teeth. This slim and portable Sunsmiler toothbrush draws power from a safe non-rechargeable battery pack. It has replaceable heads with DuPont soft bristles that reduce bleeding and sores and phthalate and BPA-free components and retails for a few dollars in reputable stores. Sought-after by individuals worldwide, JoyiQi is a rechargeable high-powered electric toothbrush with an IPX7-grade water resistant casing that works well indoors and outdoors. 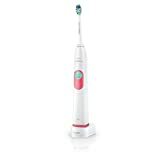 It is battery-powered, comes with three color-coded brushes, and has an advanced sonic technology that generates up to 34,000 vibrations per minute to remove plaque and stains up to 100% better than most manual models. It is also durable and has a plethora of innovative features that not only boost its ease of use, but also functionality significantly. Its automated 30-second reminder, for instance, protects users from over brushing. Its two-speed system (sensitive and normal) works well for individuals of all cadres, while the charge dock that it comes with supports slow and wireless charging. With a new model, you get three ready to use brushes, 30-day money back guarantee, and limited 365-day limited warranty.